Grass Valley Elementary’s schoolwide shift towards connected learning and maker education, supported by an LRNG Innovators Challenge grant, is letting students shine by giving them opportunities for authentic expression while connecting to their passions and communities. This is how Paula Mitchell, a teacher at Oakland, California’s Grass Valley Elementary School begins the story of her school’s embrace of student choice and connected learning. The shift began in earnest in the 2016-2017 school year, as four of Grass Valley’s classrooms implemented a new project-based learning curriculum. This year, the transformation has gone schoolwide, thanks to a grant from the 2017 LRNG Innovators Challenge. The LRNG Innovators Challenge grants stem from a partnership between LRNG, powered by Collective Shift, the National Writing Project, and John Legend’s Show Me Campaign to help educators extend time and space for Connected Learning. The Connected Learning theory posits that learning happens on a continuum—in school, as well as at home, work, and among friends—and is driven by students’ own interests and life experiences. Through this project, called Linked Learning with Maker-Centered Education, Grass Valley Elementary is expanding its makerspace and leveraging that maker ethos to transform the whole school with school-wide projects, crowd-sourced afterschool events, and support for individual pursuits and tinkering. School-wide projects establish a broad, guiding theme for the whole school, and then let individual classrooms and students find unique ways to explore that theme and demonstrate their learning. In the fall trimester’s “Self as Superhero” project, students were tasked with identifying a problem in their community, whether that be their classroom, school, neighborhood, or beyond, and worked through the skills and traits that they, as superheroes, would need to tackle their issue. Students worked on a variety of problems, and their final products took many forms, including comic books, costumes, action figures, and posters. One class even decided to put on a shadow puppet show, working collaboratively to write a script, build their superhero shadow puppets, and even figuring out how to build and operate the lighting. Students had the opportunity to write, create, and construct, all while coming to understand themselves as superheroes: change agents with the creativity and power to have an impact on their communities. The project culminated in a day-long Comic Con event, where students showed off their projects, proudly displaying comic books and art, as well as donning their carefully crafted costumes and acting out their stories. The day also featured some unexpected community connections, including Amana Harris, the activist whose book had inspired the project, as well as a local artist whose paintings of African-American superheroes wowed the students. In addition to the school-wide projects, Grass Valley’s makerspace holds regular afterschool events, with project ideas crowdsourced via a simple sheet of paper posted in the hallway. 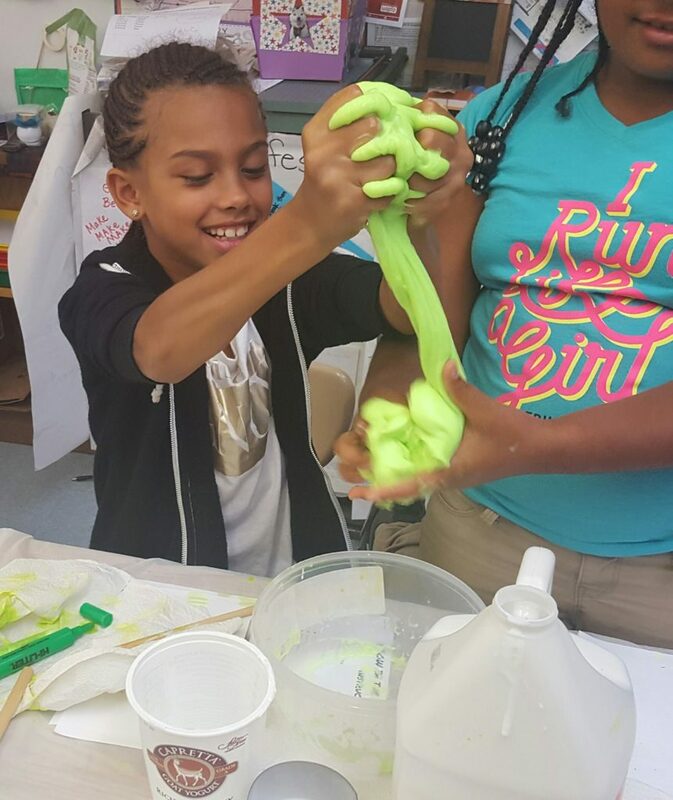 This has resulted in a variety of projects, with slime-making emerging as a particular favorite. The makerspace also provides the opportunity to pursue open-ended, individual projects: students can bring in an idea, and teachers will support them in creating and carrying out a project plan. But the benefits of this approach don’t stop at giving students more say over what they’re learning; perhaps more profoundly, students now have much more agency over how they learn, and how they show their learning. “Through this project there’s an opportunity to showcase skills and talents that a lot of teachers didn’t know their kids had, until they tried a more hands-on approach and opened it up to the students’ vision,” says Mitchell. This can be especially noticeable for the school’s special education students, who, despite experiencing difficulties with more traditional forms of school participation, are able to truly shine when given the opportunity to express themselves in a way that is authentic to them. This authenticity is at the heart of what makes the project, and Connected Learning in general, so valuable. By reshaping school work around students’ interests, not only in content but also in form, Grass Valley is creating opportunities for students to bring their passions and talents into the classroom (and library!) with full force, helping them grow into curious, creative, and skilled adults, ready to make an impact in their careers and in their communities. Creativity is inspired by many elements. In our Wonder Workshop, we hope people’s inspiration comes from the supplies in our space or from our Maker challenges. We try to foster a creative environment and activate all the senses. One of these senses is sound and what better way to activate this sense than by playing music. If you’re feeling in need of some inspiration, give these songs a listen. Believe in yourself, work hard, stay focused, and one day you’ll get to where you want to be. That’s the power of yet. From the movie Zootopia, Shakira brings the Latin pop beat to this song about trying even though your chances of failing might be high. “Try Everything” teaches our students that you have to try, try and try again to learn and expand your knowledge. A child might get discouraged from peers or get down on themselves because they might compare themselves to others but Rachel Platten tackles this problem with her anthem to keep fighting. You have to fight back and prove that you can achieve. The song and music video empowers the child who has creativity and strength. The value of stamina is highlighted and reminds us that is the way to become the greatest. It reminds us to keep going even when times are hard. Even though the idea of failure can be scary, this song reminds us that when we get knocked down, we’ve go to get back up again. That’s a big lesson children learn when working on projects-not everything goes according to plan, but you have to keep on trying and you just might surprise yourself with what you can accomplish. This song reminds us that it’s ok to ask for help from our friends. It’s ok to start over and change what you’re doing for the better. In May of 2017, we were thrilled to learn that Grass Valley Elementary’s Wonder Workshop in conjunction with MakerEd had been awarded one of only ten LRNG Innovators Challenge grants given out nationwide. This grant helped fund the materials and supplies for our 2017-2018 Maker program which included classroom making projects, individual student maker projects, after school maker workshops, family making nights, and our soon to be released Library Maker Take-Home Kits. We focused on bringing students’ passions to life by linking home and school interests. As this grant comes to an end, look for more posts that examine and share the work we did during the past year. Read on to find out more about the LRNG Innovators Challenge Grants and Connected Learning. LRNG Innovators began in 2014 and launched its third challenge in the beginning of 2017, inviting educators to imagine engaging ways to help young people explore their interests, thereby igniting a passion that can lead to college, to a career, or having a positive impact in the community. We sought proposals for programs, curricula, or projects that actively help youth discover interests connecting the spheres of their lives, both in and out of school, and provide potential future opportunities. Connected Learning research demonstrates that all young people benefit from opportunities to follow their interests with the support of peers and mentors and that give them the time and space to create work that is meaningful to them. With support from the National Writing Project, John Legend’s Show Me Campaign, theJohn D. and Catherine T. MacArthur Foundation, and Collective Shift (lrng.org), the LRNG Innovators challenge supports teams of educators in designing, testing, and sharing solutions that build the future of creative and connected learning today. Grass Valley Elementary Educators will expand project-based learning and Maker Education throughout school and the community, including the school library space and students’ families. As a small public school in Oakland, California, embarking on a culture shift, these educators are moving away from whole-class, lockstep instruction, and toward small-group, personalized learning with differentiated instruction based on students’ interests and needs. In the expanded MakerSpace, the school community will be invited to come tinker, explore their interests, and make, in collaboration with expanded project-based learning opportunities throughout the school. The school library will extend access and equity by making available take-home Maker Kits that include books and hands-on activities that students can make on their own or with their families. Taking making to another level or to your home has never been so easy. Today’s technology makes it easier for parents and educators to provide another mode of making that doesn’t need a makerspace. We encourage you to introduce technology such as your smartphone or tablet to your child or student to start making. These mobile devices have made software practically free and in abundance and are a great resource for creative education. So what apps do I encourage to download? Do you want your children to make their own game, website, animation or app? Those things are now possible with this app. Children will learn through color and simple commands that will set their foundation in the language of coding for the future. Do not want to carry a bag of Legos everywhere you go with your child. Well, let me introduce you to this app that lets your child build their own island using digital Legos. Your child will learn what he/she need to build an environment and let his creativity run wild with his own type of world. Go beyond the coding apps, this app shows and help develops manual making. The app explains different types of making such as leatherworks, homebuilding, film, and the list goes on. Children learn by watching videos, gathering experience points, doing challenges and getting encouragement from fellow app users. Children gain online patches for each type of making completed. Kids love robots. This app lets your kid use coding to guide the robot to complete the task. There are multiple levels with each one getting more complicated by the time they complete the app they will be experts in coding. Sounds a bit complicated, no worries the app teaches the student how to use the app and the different coding commands. Available on the App Store, FREE or for extended version $3.99. Also available on Google Play, $2.68. There you have it, 5 great STEAM Making apps, that any parent, educator or maker enthusiasts can download. Remember, Everyone is a Maker, so even adults can download these apps to learn. Making does not have to be expensive for the educator to incorporate it into the classroom or for a parent to bring it into the home. It can be relatively cheap–you just have to know where to look for. You can basically make a makerspace at no cost at all. Below are some great places to look for free or cheap materials to bring making to your classroom or home. Download the Unconventional Resources document. Look for scrap piles of wood, usually located by the cutting area. If you ask them nicely and tell them it’s for a kid’s project or you are an educator, they can cut the pieces of wood. Ask to speak to the manager so you can setup a date to stop by and collect as much as you can from the scrap pile (of course, flash your educator badge). Ask if you can collect some of the cardboard. They usually are willing to work with you to get rid of cardboard. I recommend setting up a specific day you will stop by (for example, the second Monday of the month). Stop by after the holidays during their clearance sales and ask if you can have any of their leftover holiday theme items. Again, flash your educator badge, and most of the time they will give you items for free. These are just a few places and tips to help you get into making without breaking your budget, and it is a great way to start exercising your creativity by looking for supplies in random places. We are excited to announce that we will be at the Lighthouse Maker Faire. Our students will be leading a maker station and there will be demonstrations by our Maker Ambassadors. Lighthouse Maker Faire takes place April 21, 2017, from 10 am -2 pm. Join us for Wonder Workshop’s first official Maker Faire. Register here to attend for free. We hope to see you there and our students can’t wait to share their making knowledge with you. Download the Wonder Workshop Brochure. How can we, as food scientists, investigate ways to interact with food?